The New England Amateur Rowing Association banners hanging on the boathouse’s second floor attest to Riverside Boat Club’s long and accomplished history. Their embroidered silk and fringe evoke an era when rowing had a more prominent place in the sporting universe than it does today. To some extent, however, they are wall paper, classy but part of the background. When you learn the story behind the two hanging to the left of the porch door, awarded to the winners of the association’s July 4, 1909 regatta singles and eights events, those banners may take on a more vivid place in your consciousness. The day’s racing had been delayed by a strong northwest wind. The last event, the race in question, was for junior eights. At 4:00 PM six boats, including one from Riverside, left the line. The Boston Medical Examiner, who happened to be the race referee, said that the St. Alphonsus boat clashed with another boat under the Harvard (Mass. Ave.) Bridge and sustained damage. Three boats, led by the Jeffries Point R.A. from East Boston, with Riverside a length behind, crossed the finish line and promptly sank. The other three boats, including the one from Roxbury’s St. Alphonsus Association, did not make it that far. Its Edward Norley was reported to be a strong young man, a steam fitter who planned to attend Fordham University in the fall. He couldn’t swim. Although a rope was thrown to him, he failed to hold on to it. The body had not been recovered. The race results were reported in the sports section. 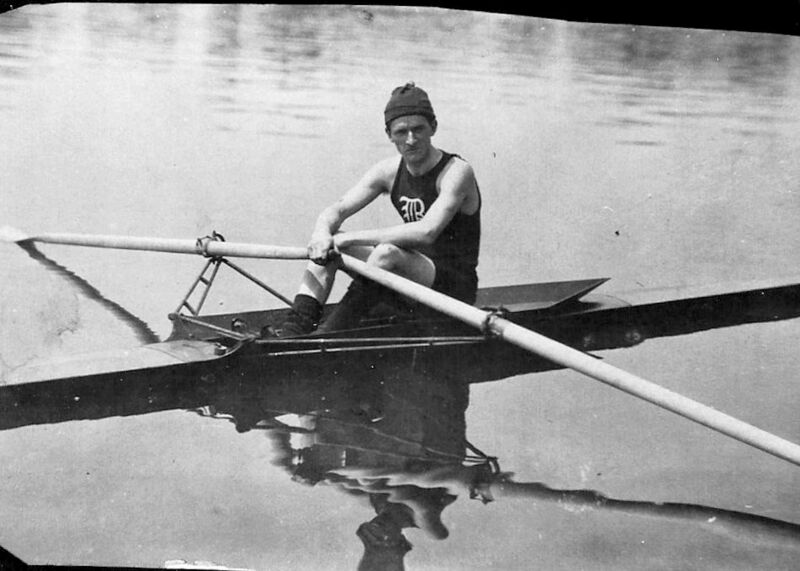 The headline, apparently without intentional double meanings, states that, “Upsets Are the Order of the Day in the Regatta on the Charles.” The story begins, “The Metropolitan Boat Club of New York was represented in almost every event and the individuals performed well, but they were beaten in a match race with the Riverside eight-oared crew”—as is attested to by one of the banners. As for the other, the paper reports that, “Carey Faulkner lived up to expectations and played with the field in the senior singles, winning in easy fashion….the light craft could hardly live in the rough sea. It was a case of the men that could keep their boat afloat in most races rather than the speedier oarsmen.” Riverside’s winning time in the mile and one half eights race was 8 minutes 35 seconds. Faulkner’s winning time was 12 minutes 17 seconds, with Murphy of B.A.A second and Blackman of St. Alphonsus third. The story is accompanied with a photomontage including the Riverside eight at the dock and Faulkner sitting in his boat, and another picture of the lead three boats in the junior eights event in heavy waves silhouetted against the Cambridge gas works. So when you glance at the turn of the 20th Century banners awarded to Riverside for victories in N.E.A.R.A. regattas, if you spot the two from July, 1909 you might pause a moment to reflect on the story behind them.